Every sailor has a collection notes, scribbled calculations, file cards, etc with helpful tips and calculations. On this page, you will find links to a number of such notes that I have organized. There is a brief explanation of each note and a link to either a page and explanation or to a downloadable copy. Feel free to download them and use them where they fit. Check back often for new additions. One of the most basic calculations is Distance / Speed / Time. Most of us are familiar with the navigator's home address - 60 D St.
Click here for a straightforward explanation and some simple calculations to determine distance to the horizon. This handy chart outlines Francis Beaufort's famous chart of wind forces and how they appear to sailors. Click here for the Beaufort Wind Scale. MAYDAY refers to the imminent possibility of loss of the station (i.e. your boat) or of life. PAN PAN (pronounced 'pawn pawn') signals an urgent but not life-threatening situation on board. SECURITĖ (pronounced 'say cure i tay') is the signal sent when transmitting navigation, meteorological or safety information. Here is a detailed guide to radio communications. There is a specific format for a distress call. Click here for a formatted Distress Call Form. Often, it can be quite difficult to make out a voice message due to interference or static. In such situations, a backup plan is to spell the message. Because some letters sound similar, a phonetic alphabet was developed. Click here a chart of the Phonetic Alphabet along with the Morse Code equivalents for each letter. Before the advent of radios, flags were used to communicate. Over time, a very specific pattern of flags was developed and remain in widespread use today. Click here for a chart showing the International Code Flags. Environment Canada has written an excellent publication on weather. Serge Besner, the Project Manager, has provided the files to us and they are certainly worth downloading. A sail plan is a voyage itinerary that includes a description of your boat and travel route. Sail plans are also referred to as trip or float plans. And, they are vital. At a minimum, they give Search & Rescue units basic information that can be used to find you in an emergency. Used well, they can be an excellent planning tool. Here are two - 1 from the US Coast Guard and 1 from Transport Canada (Part 1 & Part 2). The Canadian Coast Guard Auxiliary - Pacific Region has an excellent powerpoint presentation on passage planning here. A basic rule is that all directions should be shown in True degrees. As you convert from Compass to Magnetic to True degrees, each step will require you to either add or subtract the appropriate value. Going from True to Magnetic to Compass bearings, ADD west corrections and SUBTRACT east corrections. Going from Compass to Magnetic to True bearings, SUBTRACT west corrections and ADD east corrections. Click here for the calculation and some examples. There is a standardized set of symbols that are used on navigation charts. It is not really possible to memorize them all but it is clearly useful to know the most common ones. The symbols are listed in Chart 1 (both Canada and the United States have a Chart 1) as well as the British Admiralty Chart 5011. Weather fronts - whether warm or cold fronts - give all kinds of clues and hints as to what is happening AND what is likely to happen. This illustration of fronts will clearly show you what you can expect. A medical emergency on board can threaten the best-laid cruising plan. These two guides were developed for merchant sailors and cover far more than the average cruiser would likely ever need. But - they are authoritative and comprehensive. You can find the UK Guide here and the US Guide here. Proper provisioning is as important as any other task and getting it right can take a fair bit of time. This spreadsheet calculates how many of every item you need to buy, taking into account how many items you already have on hand. You can sort it to create a shopping list and print that shopping list out if you have access to a printer. Make sure you download the pdf file with the instructions. NOTE: This file is a .zip file. It should open properly without any problems. If not, contact me directly using the Contact Me form on the site. I will email it directly to you. There are over 200 locations in Ontario where a visiting American boat or a returning Canadian boat can report. Reporting Sites are listed by Port and by Lake. Around the Great Lakes, we are blessed with a wide variety of museums. Here is a list, organized by lake, of some 50+ museums that can add to your appreciation of the area through which your are traveling. <b>BoatUS</b>, the large US boater organization, offers an excellent winterizing checklist. Based on their extensive experience as a boat insurer, this provides a fairly comprehensive checklist. The checklist can be found here. 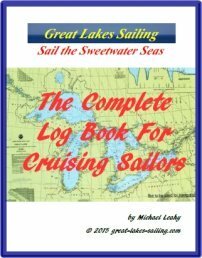 This Light List contains a list of lights, sound signals, buoys, daybeacons, and other aids to navigation for the US waters of the Great Lakes. The Canadian Light Lists are published as individual lists for each body of water. They are listed from Lake Ontario north to Lake Superior. Individual lists are published for connecting waterways. U.S.government policy is that as this information was paid for by the taxpayers, its is therefore available to citizens at no charge. Canadian government policy is that the information is paid for by taxpayers but then sold to a private firm that resells them to bookstores and chandleries. That way, citizens get to pay to see what they have paid for. The 2016 Canadian Sailing Directions are only available from a re-seller. I recommend The Nautical Mind as probably the best marine book store dealer for charts and sailing directions. Their link can be found on right side of this page.